Poor Old Zogwort was on the receiving end of all of my Plague Beasts this game. I managed to establish a firm grip of the command phase with cards like Chaos Fanatics and Promotion. The game came to a conclusion on the fourth turn. I had all three of my Gleeful Plague Beasts at the first planet, along with Zarathur, which meant that all of my opponent’s units would take six damage at the start of the combat phase. Needless to say, I won that fight. This was another game where the Plague Beasts played an important part, but my MVP card has to be Ammo Depot. By turn three I had managed to get all three copies of it onto the board, and during the game they drew me over ten cards. During the game we were fairly even on command. My opponent had a massive stack of resources to use but very few cards and most importantly, units, to play. This allowed me to win my third green planet on turn five by spamming the field with cheap units (I had three Zarathur’s Flamers there). Anyone that has been following the major tournament results around the world will know that Packmaster Kith is currently the deck to beat. With Gleeful Plague Beast and Warpstorm in my deck I felt like I would have a decent chance of beating the Khymera swarm, especially as one of Dark Eldar’s most potent tools, Archon’s Terror, cannot be used before the beast’s forced reaction goes off. However, the Plague Beast is easily undone by Dark Eldar’s other deadly weapon, Klaivex Warleader. Some of you may be of the opinion that you should just shield all the damage done to units you don’t want hit by the Warleader, but it is not practical to do so; even with cards like Ammo Depot you just don’t have the cards to do it. This proved to be the case in our game, as on two occasions Warleaders dropped in, instantly killing a Plague Beast, then dispatching another of my units with their three attack (usually a Khorne Berzerker). The command phase was fairly even in terms of struggles won, but when my opponent played Archon’s Palace it cut off my two-card planet. Combined with no Ammo Depots until the last turn, this effectively starved me of cards. The final turn’s combat was embarrassingly one-sided, with Kith taking the third planet she needed to win the game. This week the Astra Militarum and Tau were relegated to allies only (the Astra Militarum were VERY popular ally choices, appearing in three out of the eight decks). Space Marines were the most popular faction this week, which for our local meta is rather unusual. So I finished second today, which I was pretty happy with. My closest rivals in the league, Gareth and James L, finished 4th and 5th respectively, which meant that my best four scores this season were high enough to win the league! 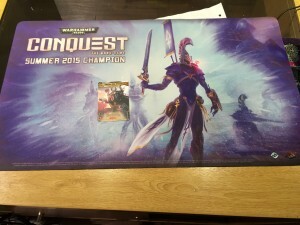 This meant that I won the playmat and a copy of the alternate art Zarathur. I was quite happy with how my deck worked out, but I would be tempted to swap out the two copies of Dire Mutation for Cacophonic Choir, as they are the sort of cards that would have possibly helped me out against the Dark Eldar swarm. Ammo Depot proved to be a fantastic card, and thanks to keeping the costs down in my deck I was able to cycle through my hand fast enough to be able to take advantage of it’s ability. Gleeful Plague Beast was the other star of the deck; the damage it dishes out with it’s forced reaction can be devastating against certain opponents, especially if Zarathur is there to amplify it. For our next league we are probably going to extend it to six weeks, but still pick your best four results. With another faction being released (Tyranids should be out in the UK tomorrow!) this extended league would give people more opportunity to try out unusual/unfamiliar warlords in a competitive environment, without feeling like they are penalising themselves. A few of us have been talking about doing a mini-league between main leagues, but with a twist. In this league each player would be assigned one faction to use, with all eight factions being represented. We would then have to use both current warlords for that faction and play seven games with each. I’ll be putting more details up nearer when we start it. We are also going to be running a special tournament for the release of the Tyranids but again, more details to follow.